Late February is a good moment in time to say 'Goodbye to February 2016'. This month didn't see the usual nice February weather, there was a lot more hard wind and a lot more rain than usual during an average February and as a consequence the East coast beaches were many times not that great for swimming. Big waves and the yearly rip curls and undertows were prominently in attendance. We also had sunny days, but there were too many days with strong wind and rain to make it a memorable month for the weather. I spent this month at home, with as a personal highlight running my 3rd full marathon ever in Surat Thani on 14th February, smashing my previous personal best with half an hour. 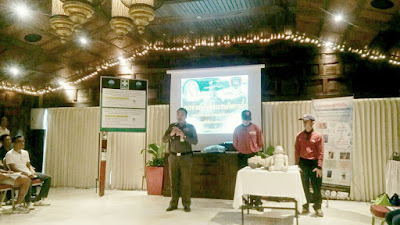 Other than that it was a fairly quiet month although there were Box jelly fish awareness presentations in Nathon for hotel staff and we visited this years 'Wien Tien' event at Wat Plai Laem. Looking forward to March, during which I will find myself back on Koh Phangan for a PADI IDC and the 4th Samui Midnight Run will be on the calendar towards the end of next month, to be exactly on 26th March. Tickets are available as of tomorrow at Zazen resort in Bophud. Som tam being made at the Plai Laem night market, which is held three times a week. The forecast is predicting fairly sunny skies with possibly some rain come next weekend. 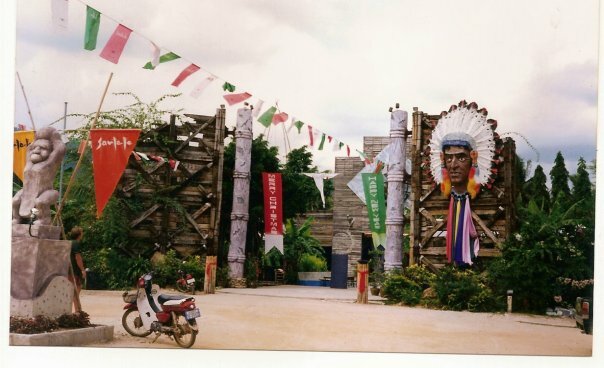 Here are some pictures by Dave Carlo from Koh Samui in the 9-tees, around 1994, so all copyright belongs to him! A nice step back in time. 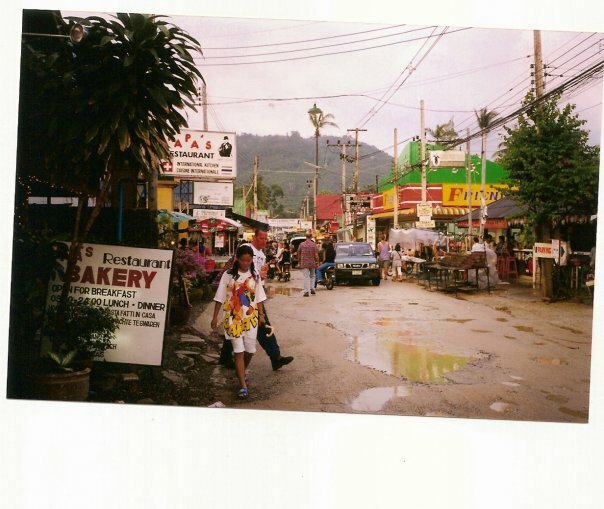 Chaweng beach road during a rainy day, when the road wasn't paved yet. Such a pier brings back memories, although I didn't arrive until the late 9-tees on the island. It looks like the Fisherman's Village pier, maybe, possibly? Who's been long enough to remember Santa Fe in Chaweng, a very popular night spot for the local Thai young folk that eventually got closed down because of the violence. Samui airport with all of it's early charms, parking was a nightmare though! These kind pf pictures seem to be popular, so I hope you enjoy this lot as much as I do! If you have any old Samui style pictures, please share hem with me, thanks in advance! The forecast is looking fairly good for the next ten days, but the forecast is also a bit shaky at the moment, it seems. Some rain may be expected Tuesday and Wednesday, providing we have any dry days at all before we get there. It's supposed to clear up after Wednesday and be sunny, we'll have to wait and see. The forecast is shows that the wind has disappeared and is predicting a nice ten days ahead of us with mostly blue-ish skies, laced with a few clouds . Get that sun tan out and enjoy the sun! The forecast predicts the wind to have gone by tomorrow. For the next ten days it should remain fairly cloudy to cloudy but there should also be plenty of sunny moments. A rare shower is also possible. 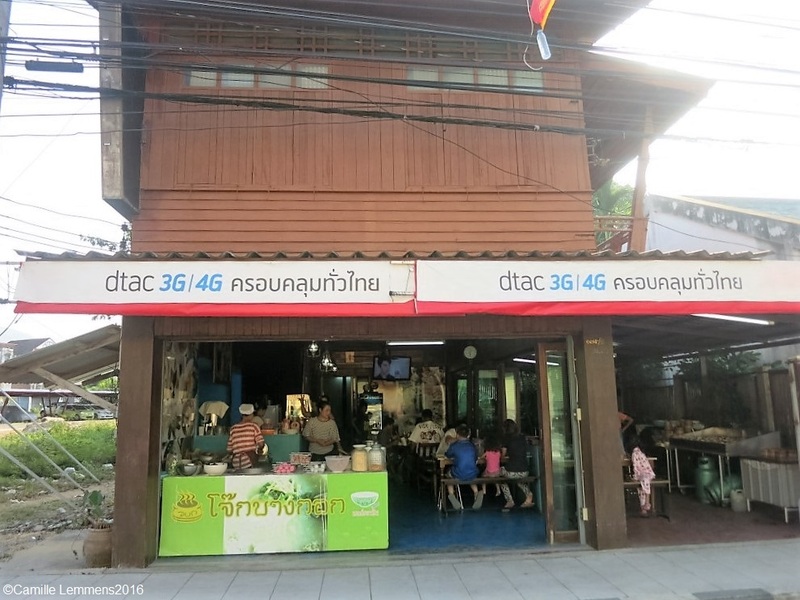 The Jok Bangkok restaurant in Nathon is a breakfast restaurant, open between 6am and noon-ish. It's open since about five years and the last two to three years the 'Dim Sum'option has been added and it proofed to be very popular. It's located in Nathon's main one way street, just a hundred meters short of the T-junction where you can take a right to the beach boulevard and it's an original old Chinese style house, or to be even more precise, Hainan style (check the link to see a picture of the same building back in 2008). 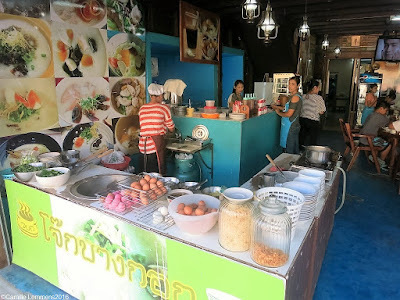 Visitors are mostly Thais but you're more than welcome if you'e a Westerner and the menu is very simple and easy and straightforward. The dim sum, as shown above in the picture, you only have to go and point at the small plates you want and a staff member will have them steamed for you and brought over to your table once they're done. The dim sum is fairly healthy and also has plenty of vegetarian options, besides fish and meat options. The plates are really small but also cheap. 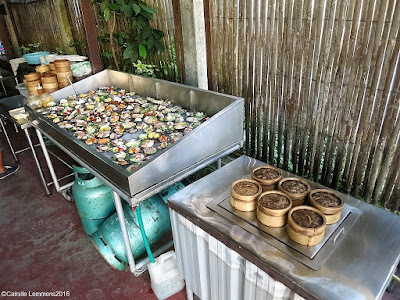 We had a total of eight to nine dim sums, 2 jok dishes and two times eggs sunny side up and a few things as carry out and it totaled around 400.-THB. A very popular Thai breakfast dish 'jok' which is rice porridge, but you can have plenty of different ingredients added to it, so it never becomes a boring dish. especially here at Jok Bangkok restaurant in Nathon, there are plenty of different options available, ranging from just your regular minced meat to the pink or '100 year old' fermented eggs, just to name a few. If you find yourself in Nathon before noon, have a look if you can find Jok Bangkok, it's not hard to find and well worth a visit. 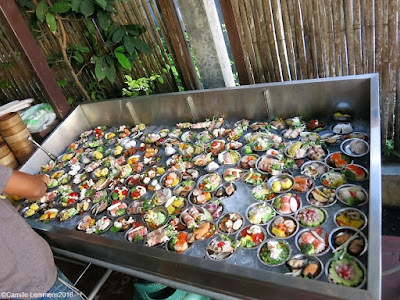 It's a very local experience and don't worry, the food is not spicy! 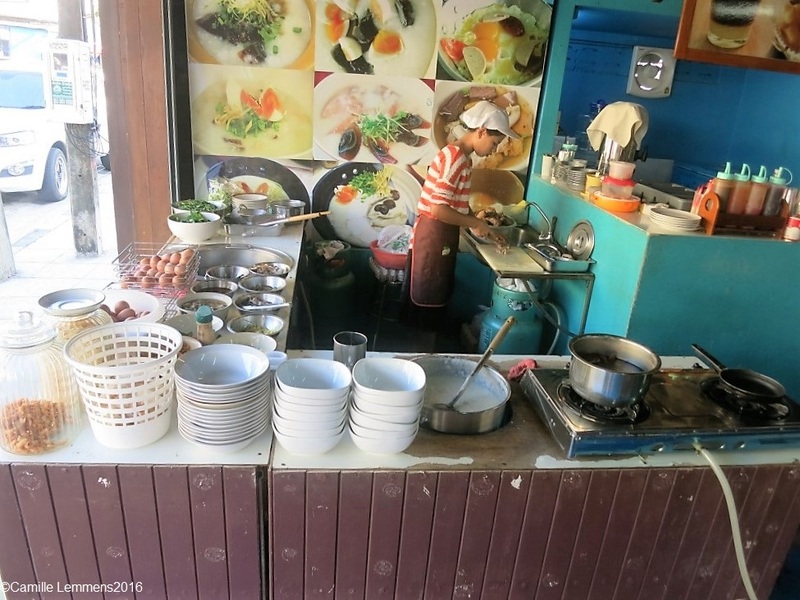 According to my wife there are a few similar restaurants around the island, one supposedly in Bophud, so more research needs to be done here! 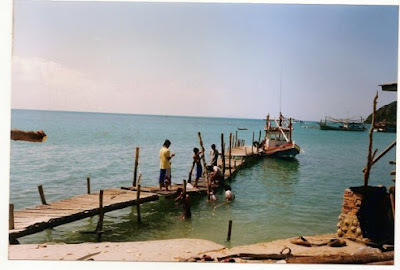 Coconut plantations in the Lipa Noi area, this is how Koh Samui used to look like. The forecast predicts strong wind today and storm like winds this coming night, Sunday may still be relatively cloudy but the after that it should clear up and be sunny again. The forecast remains stable, with mostly sunny skies but apparently also a possible shower until Sunday. The wind is about to pick up and should be strong on Thursday and Friday and after the weekend we should be back to sunny skies. 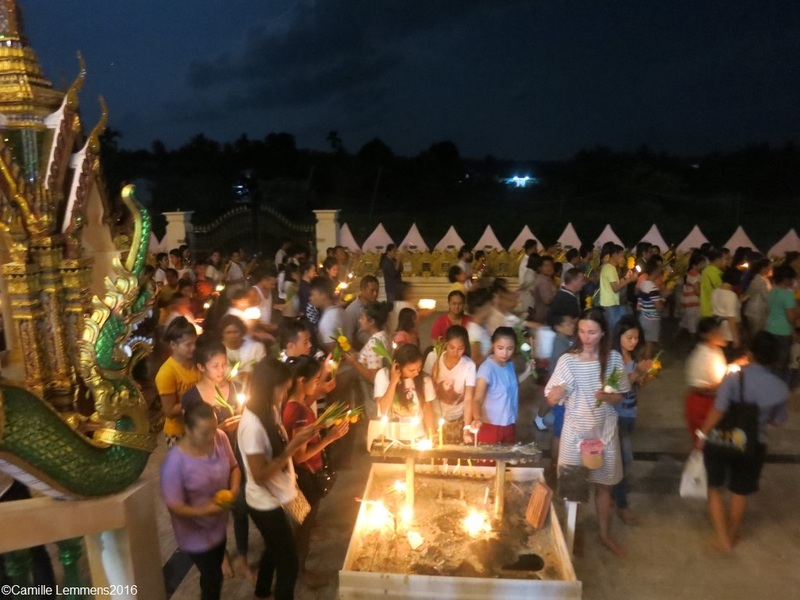 Yesterday as part of Makha Bucha day, there was the Wien Tien at Wat Plai Laem, when locals and visitors alike walk around the temple (wien) with a candle (tien) in their hands. 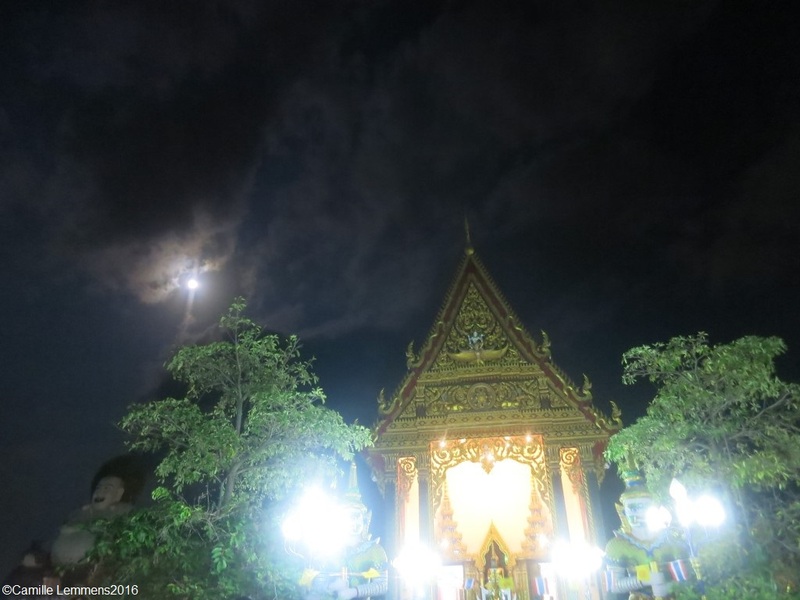 It's always held at the third lunar month of the year, under a full moon and it was beautiful weather yesterday which attracted many people to the temples around the island, including Wat Plai Laem, our 'home' temple. We arrived around 7.30pm and there was me thinking that we were a bit late. There already plenty of people waiting in front of the Bot, and the Bot itself was maxed out, so many people had to sit behind the Bot and listen to the chanting by the Monks from an excellent PA system. When we arrived, the ceremony was already in full swing. Monks were chanting and this lasted for over an hour and a bit more. More and more people kept showing up though and people started to take positions and sit down all along the walls around the Bot. An interesting and surprising fact to me was the amount of Westerners visiting this event. Plenty of Westerners with their Thai wives or girlfriends but also Western families seemingly without any Thai connections. The last time I participated in this event, a few years back, I was pretty much the only Westerner about. It was a very interesting event, one of my favorite events at the temple, because of it's peacefulness and the opportunity to put flowers and incense at the beloved ones remains at the temple site, around the Bot during a religious holiday. 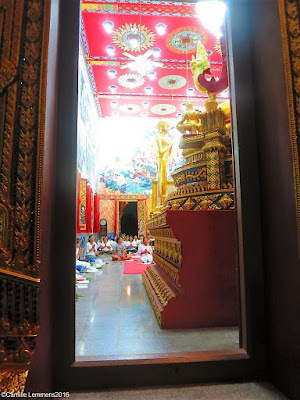 Hope you had an opportunity to visit as well at one of Thailand's many temples and enjoy this important Buddhist holiday or festival. I was glad I could join this year and enjoy the event! The weather forecast for the next ten days changed lightly, tomorrow the wind is supposed to pick up, culmination in thunder like storm conditions Thursday to Friday night and between Wednesday and Saturday we may have some rain. After that it looks like smooth sailing again with plenty of sunshine. Today is Makha Bucha Day again, and on this day, the full moon of the third lunar month (called Tabodwe); seven months after Buddha began his teachings, 1,250 monks gathered to hear Buddha preach. Buddha ordained these monks and spread the principles of Buddhism. This marked a key event in the development of the religion. 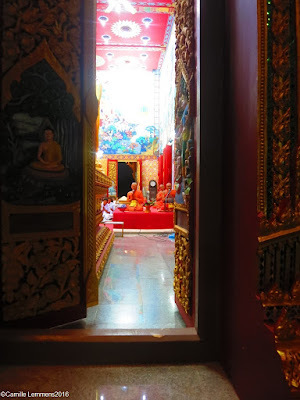 Despite the great age of these events, (Buddha was teaching over 2,500 years ago) Makha Bucha only became a holiday in 1957. Prior to 1957, the third lunar month was celebrated as a Buddhist Holy Day. In Thailand, the sale of alcohol is banned on religious holidays. This means bars and clubs are closed for the entire holiday and this is one of the bigger holidays, also banks, government offices and the like will be closed today. I saw plenty of Thai people (mainly women) on their way to a local temple to do exactly this. 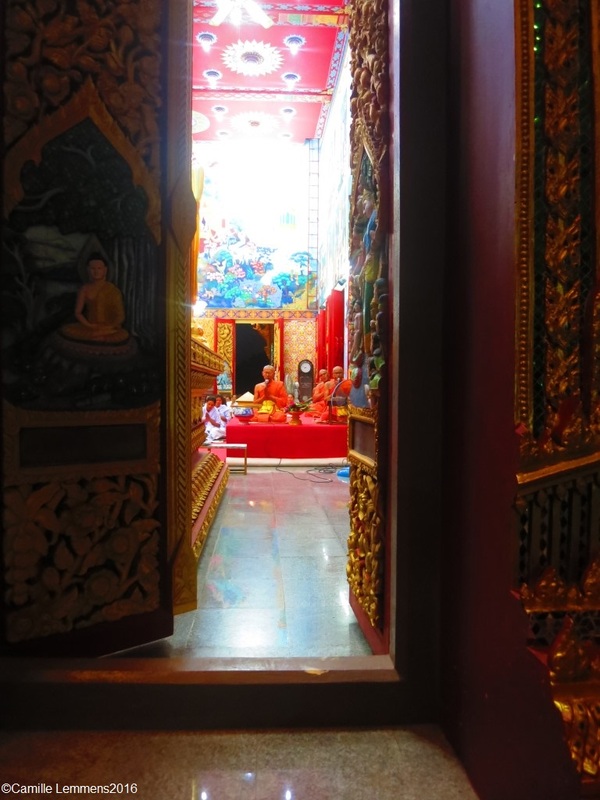 Often gifts for the monks are carried along and handed over to the monks at the temples. This one is difficult to check but in theory everyone sticks to this. This is a daily occurrence but may be more widespread today. Saw a few females today wearing white robes. 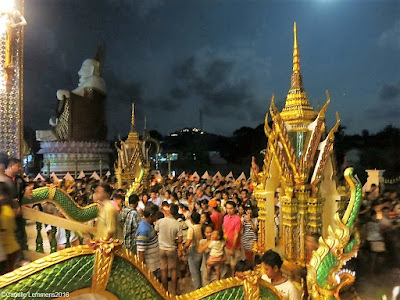 his will be held at various temples around the island, including Wat Plai Laem and we may be there tonight. The forecast has changed slightly, expect some clouds by Wednesday and some storm like wind may be crossing over the island come Thursday and Friday followed by a very cloudy next weekend. The forecast is looking good for the next ten days with mostly sunny skies and the wind picking up this coming Thursday and Friday, possibly accompanied by rain. The forecast is looking good, mostly sunny but with some strong wind tomorrow and towards next weekend and possibly some rain next weekend. The forecast is a bit strange, although sunny skies are predicted, there are a lot more clouds around compared to what is predicted. After the weekend there should be two or three days with more cloud formations but towards the last weekend of the month it should be sunny again. Not much rain is expected although occasionally a shower can be expected, especially towards the last weekend of the month. Late this afternoon I will get a flight back to Koh Samui. The forecast is changing ever so lightly but in general there should be not many clouds over the next ten days, but I'm not sure how accurate that is at the moment, since recent days have been fairly cloudy, Nonetheless, there should be plenty of sunshine over Koh Samui to enjoy a nice day on the beach or with a trip around the island or to enjoy other day time activities. There may be some wind blowing in, which keeps it cool and towards next weekend there may be an isolated shower. The forecast looks mostly sunny for the next ten days with possibly a few smaller showers towards the end of next week. Yesterday saw a very warm and sunny day around Koh Samui with a max temp of 31C, it sure felt a lot warmer! The forecast is looking good, besides some stronger wind today and tomorrow, it should be sunny skies galore for the next ten days. Later this morning I will be off to Pattaya until Thursday to meet some old friends. It's been almost a year and a half since I was last there and I'm looking forward to see how busy it is there and of course to see my friends again! It's been longer since I saw them the last time. The forecast is looking outstanding, pretty much sunny skies galore for the next ten days, enjoy and get the sun lotion out! It's a later than usual update today, since we just got back to our hotel room from the Surat Thani marathon in which I participated. It's nice and sunny here and warming up! Current temp at 10am is 'only' 29C, it feels a lot warmer. The marathon went ok, I finished 42.8km in 4 hours and 17 minutes, which is within the time range I trained for, although it's at the outer limits. I did manage to finish as tenth in my age category, which earned my a nice trophy! This was my 3rd marathon ever and I smashed my previous personal best with half an hour. It was tough though, especially the last five km's! A small pond behind our N Nine hotel in Surat Thani, yesterday afternoon a small monitor who seems to live in this pond was chasing fish. A pretty exciting and interesting view. The forecast predicts very sunny days ten days, although mysteriously there may be rain as well. Tuesday and Wednesday may see some very strong wind. Later today we will go over to Surat Thani where I will run a full marathon tomorrow morning with a time of around 4 hours. The forecast predicts cloudy skies for today and tomorrow but than it should clear up and sunny skies should be out and about with possibly some rain next weekend. A big empty land plot in Choengmon, where it was said that this would become a water park. Now it sits like this since well over a year, nothing has been anymore after the trees have been removed and some digging has been done. 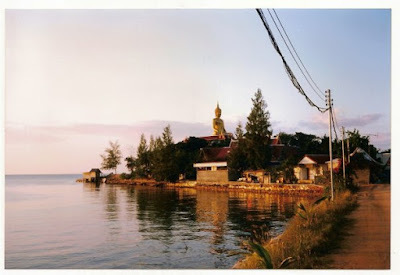 Yesterday saw a nice and sunny day around Koh Samui, it has been a few days since the sun had been out like that! There were parts of the island where there were clouds, but our North Eastern part was sunny almost all day long, without getting too hot, which is the beauty of this time of the year. Max temp reached 31C, slowly the temperatures are climbing, a little bit per day. The forecast looks good, sunny days are ahead of us and especially after the weekend it should be nice blue sky galore with hardly any rain at all except a storm like wind on Tuesday. The forecast predicts mostly sunny skies with a it of a breeze and hardly any to no rain until next week Thursday. Yesterdays the ferries to and from the mainland picked up their service again, after two days of not having run, this makes it three days before fresh produce can reach the supermarkets, which you could notice at some locations where various fresh products were lacking. Today stock should be replenished again. The forecast predicts cloudy skies until Saturday, with occasional sunbursts but as of Sunday it should become really sunny with a strong wind on Tuesday. The forecast predicts more cloudy skis until the weekend when it should clear up and the sun should come out again. Next week Wednesday may see a surge in the wind strength again. The forecast predicts the wind to have ceased by tomorrow and we should have nice and sunny days, especially come the weekend. The forecast predicts a strong wind today and slightly less for tomorrow. It's mostly cloudy until Thursday after which it's supposed to clear up and become sunny again. The forecast predicts the wind to pick up today and have a storm like force tomorrow morning and it peters out over Monday. From Monday onward we should have sunnier skies again. The forecast predicts a very strong wind with storm like conditions come Sunday morning, by Tuesday morning the wind should have petered out. From Wednesday onward we may expect the sun back again. The forecast is looking fair. Hardly any rain is predicted for the next ten days, but plenty of cloudy skies. Over the weekend we may have a storm like wind passing over Koh Samui, culminating on Sunday morning and waning out over Monday. Tuesday, Wednesday and the second weekend of February may see some sunny skies. The forecast for the next ten days shows a mix between cloudy and sunny skies with hardly any rain predicted at all. However, this coming weekend a storm is predicted with strong wind on Saturday and Sunday morning, lasting until Monday. After the to fatal box jelly fish incidents on Koh Phangan and on Koh Samui last year, there were a lot of activities going on behind the scene and this resulted also in recent Box jelly fish awareness presentations for Koh Samui hotel staff January 2016 at Rocky's Boutique Resort near Lamai. Dr Lakkana, on eof the Thai box jelly fish experts, was invited by the THA (Thai Hotel Association), Samui chapter to talk in front of the local Koh Samui hotel managers and to conduct presentations for hotel staff on subsequent days. Unfortunately a day before her arrival, Dr Lakkana's mother had an accident and required surgery and she was at the intensive care unit in Chiang Mai. Dr Lakkana had to cancel her trip down here to Koh Samui and the presentation for the THA members, Samui chapter, has currently been postponed to March. 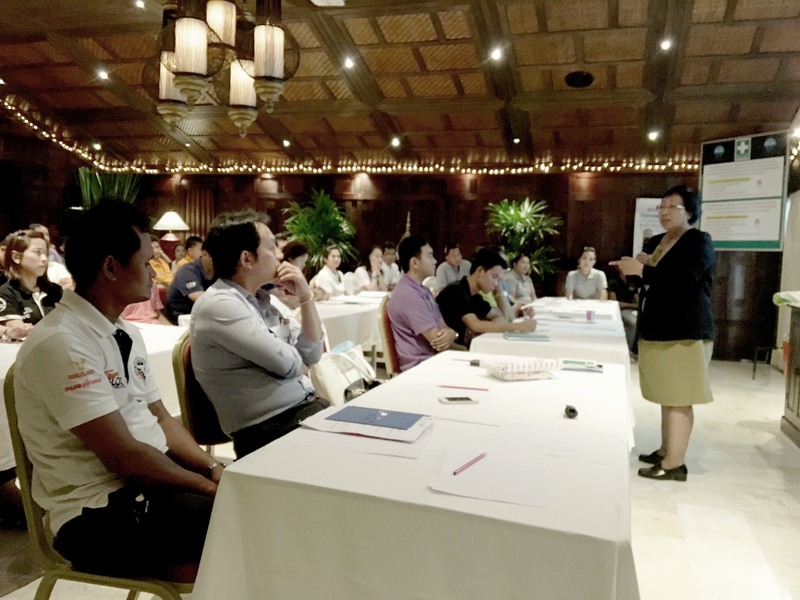 The presentations for hotel staff went ahead however and Dr Nisa of the Government hospital in Nathon and Khun Jim, owner of the Lamai Wanta hotel in Lamai, took over Box jelly fish awareness presentations for Koh Samui hotel staff January 2016. 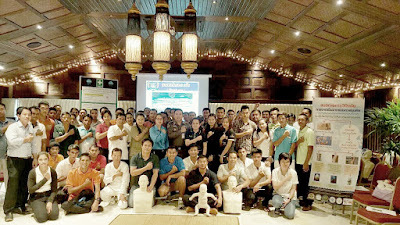 The turn out was amazing, 39 hotels with 65 staff attended (including staff from the Anantara Rasanda on Kph Phangan), which made for a very busy conference room at Rocky's Boutique Resort during the Box jelly fish awareness presentations for Koh Samui hotel staff January 2016. Besides Dr Nisa and Khun Jim, local police members, rescue team members and hospital staff were also invited and attended the Box jelly fish awareness presentations for Koh Samui hotel staff January 2016. 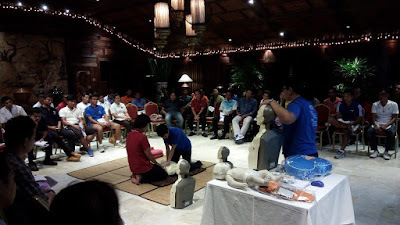 The presentation went over very well and there was some good feedback from the attending hotel staff. 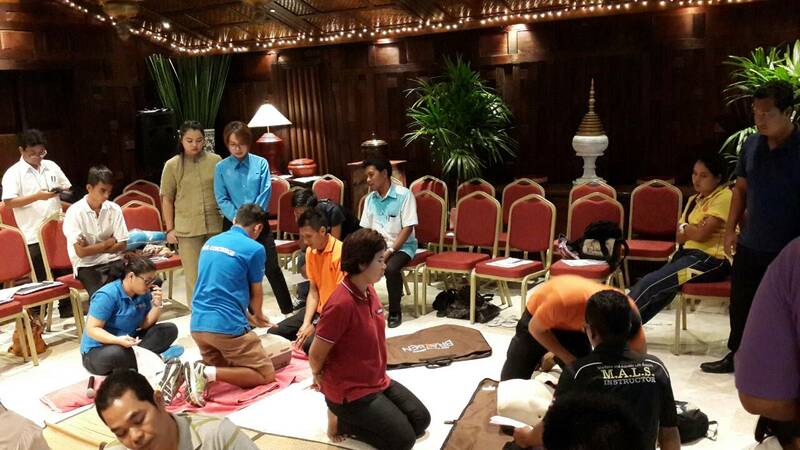 The Box jelly fish awareness presentations for Koh Samui hotel staff January 2016 ended with all attendees practicing CPR, one of the main tasks that may be required when dealing with a box jelly fish injury. 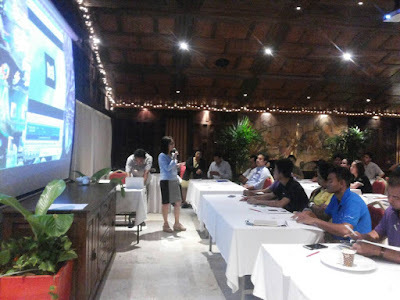 The Box jelly fish awareness presentations for Koh Samui hotel staff January 2016 show that people on Koh Samui do care about box jellyfish awareness and keep working to move things ahead and raise awareness and prevention around Koh Samui. Check also these pages out by DAN (Divers Alert Network) with updated statistics. 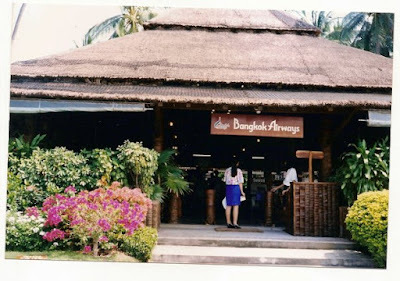 There is more to follow, through the THA chapter Samui, and by myself. I have a presentation scheduled for hotel staff on Koh Matsum. We will keep working to keep raising awareness and prevention. Please help us and join whenever feasible and spread the word! Thanks!